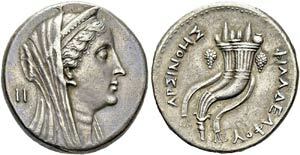 Ptolemaic Kingdom - Ptolemy II, 285-246 BC, and Arsinoe II. 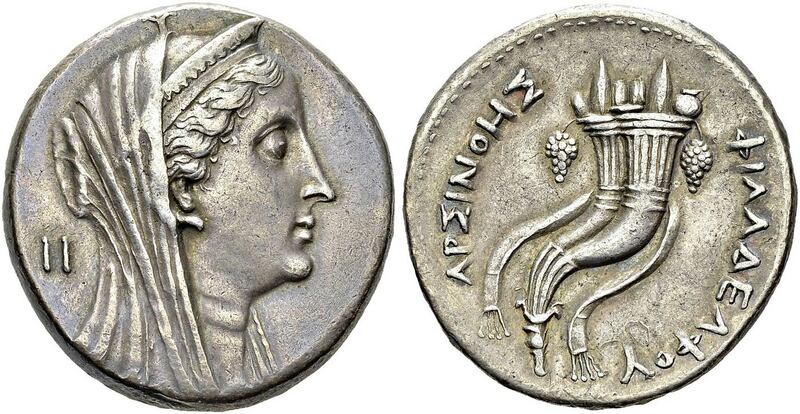 Silver decadrachm in the name of Arsinoe II, ca. 253-246 BC, Alexandria. Obv. Veiled and diademed head of Arsinoe II right. II behind her head. Rev. ΑΡΣΙΝΟΗΣ ΦΙΛΑΔΕΛΦΟΥ. Double cornucopiae filled with fruits and bound with fillet. SNG Cop. 135; H. A. Troxell, «Arsinoe’s non-era», ANSMN 28, 1973, p. 35-70. AR. 35.60 g.
Ex. Bank Leu AG auction 54, 28 april 1992, lot 194.